Martin and I love replicating our favorite restaurant dishes in our own kitchen. Last week, we finally attempted a dish that is one of my all-time favorite to eat yet we had never realized just how easy it would be to make at home — moules frites. Inspired by our brunch at Meet in Paris, we wanted our first batch to keep it simple with garlic, shallots, butter, thyme, and white wine. We managed to find Prince Edward Island (PEI) mussels at our local supermarket chain, though the size of the flesh was nowhere near as gigantic as the ones we had at Meet. This classic mussel preparation is known as mariniere, French for “mariner’s style” but defined in the culinary world as a dish that is prepared by cooking in white wine. Storing the Mussels: Odds are, the guy behind your grocery store’s seafood counter will toss the mussels into a plastic bag, tie it up, and wrap the whole thing in butcher paper. As soon as you get home, be sure to properly store the mussels. Most importantly, either take them out of the plastic bag or poke holes in it so that they do not suffocate. We transferred ours onto a metal tray, covered them with a damp paper towel, and kept them in the refrigerator until dinnertime. 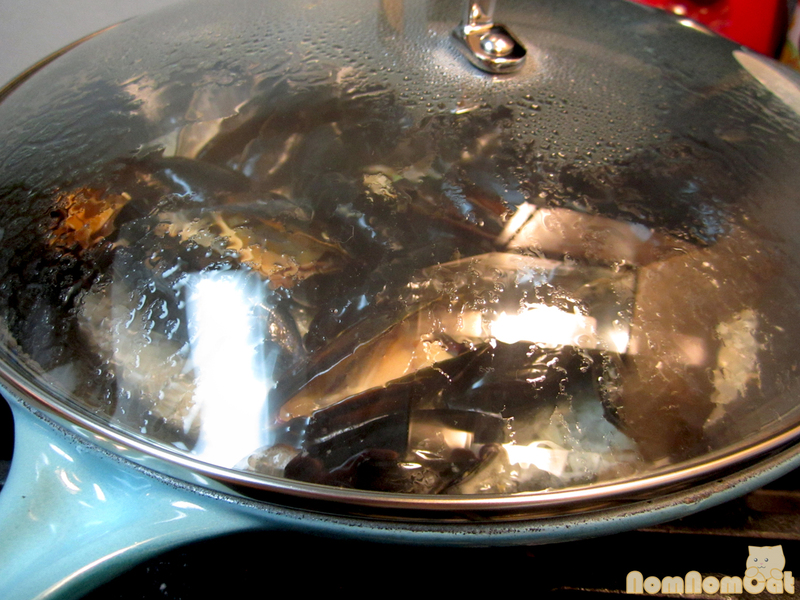 Here’s where it got a little tricky (to me anyway): BEFORE COOKING — the mussels should be tightly closed. Any open ones should close if you tap or otherwise gently disturb it. If the shells are agape and it does nothing, then it is dead and should be discarded. 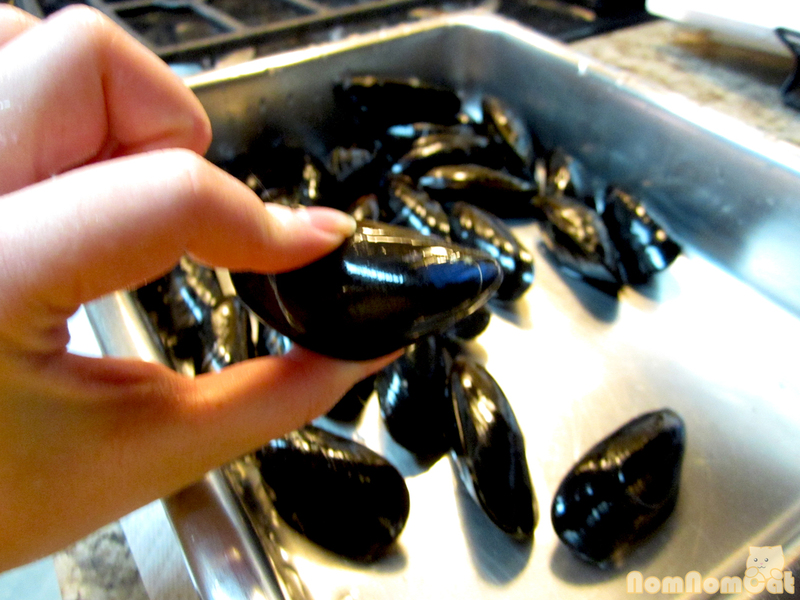 AFTER COOKING — all of the mussels should pop wide open. Any that remain shut are dead and should be discarded. Dead mussels are no bueno. 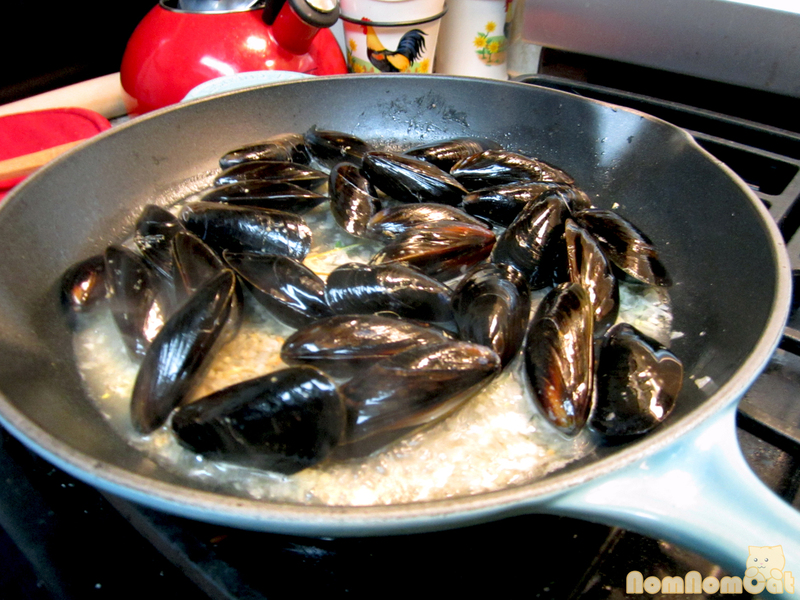 First, clean the mussels under cold running tap water. Our mussels were pretty clean, but if needed, you’ll need to remove the beards from between the shells. Set aside. In a large skillet, melt the butter. 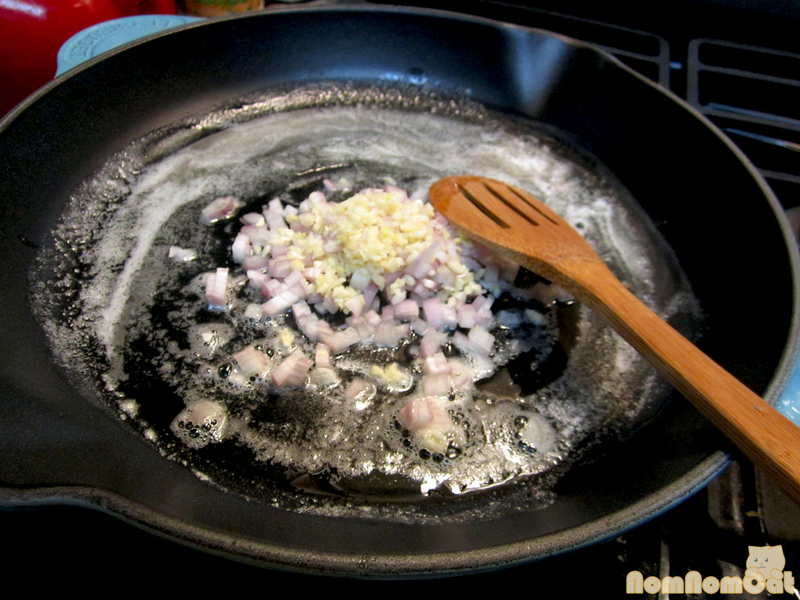 Saute the shallot and garlic until softened and translucent, about 1-2 minutes. Season with a sprinkling of salt. Add the herbs, if using, and pour in the wine. 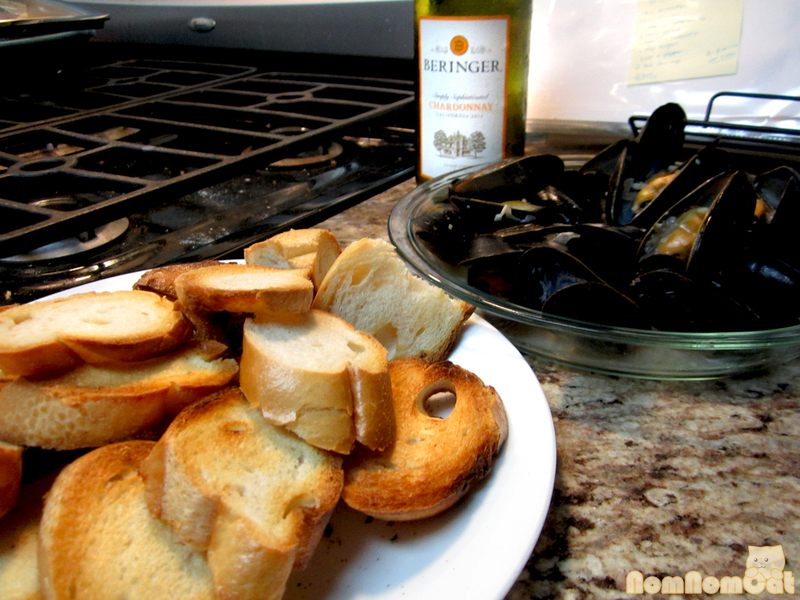 Turn the heat up to high and add the mussels, arranging them in a single layer if possible. Cover and let simmer for about 5 minutes. You’ll notice that they will gradually pop open. Start toasting off crostini-style slices of bread, if desired. 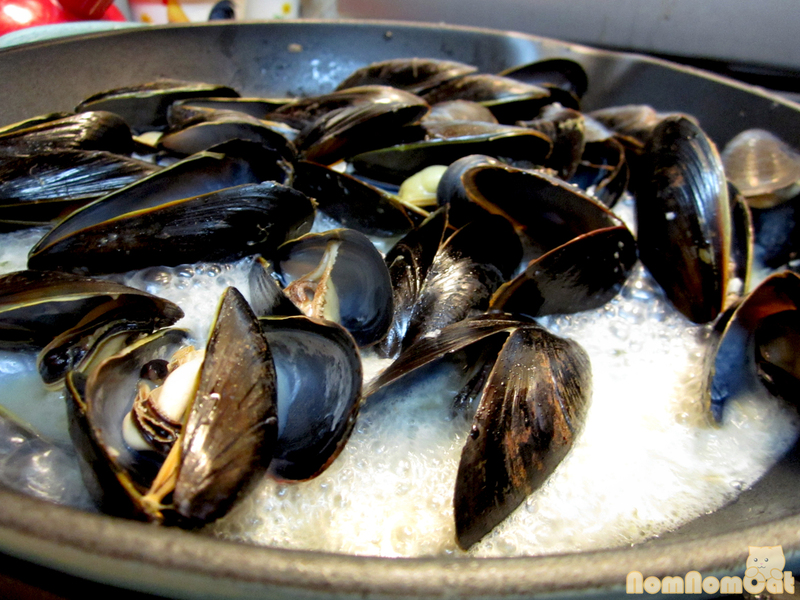 Stir the mussels and continue to boil, covered, for another minute or two. Remove the cover and serve immediately. 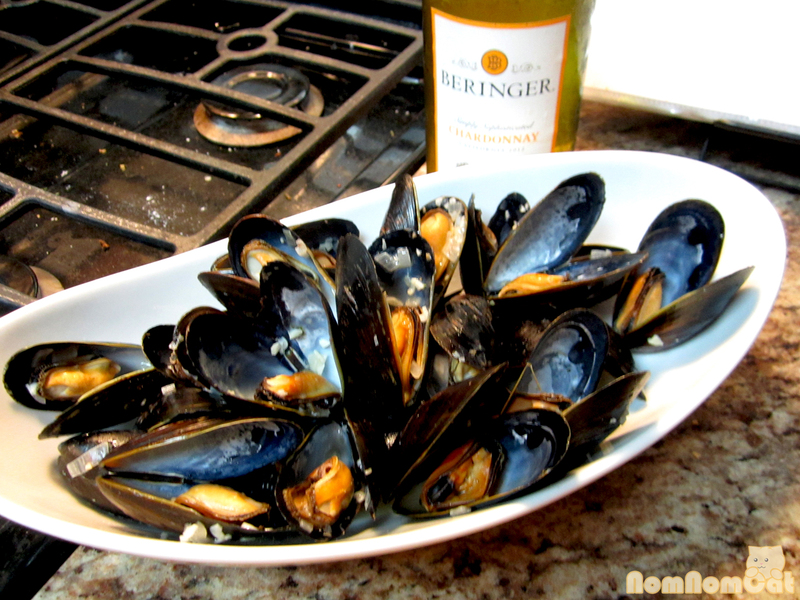 Yields 2 servings (the typical serving is about 1 pound of mussels per person). Serving suggestion: in a large bowl alongside crusty bread and French fries (to complete this dish as moules frites). Provide a spoon, if desired, but I think the best “spoon” is the discarded shell of one of your eaten mussels. Savor the flavorful broth. 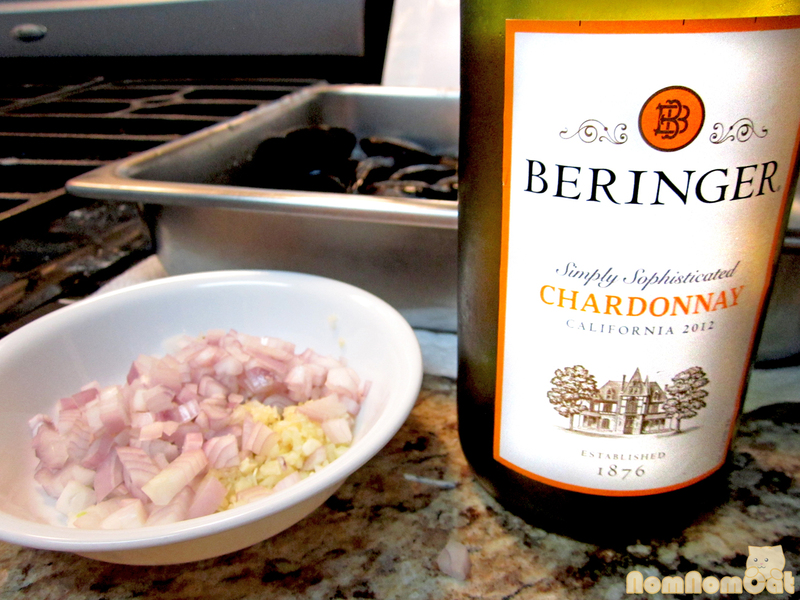 Pair with a glass of the same white wine used for cooking or a better Chardonnay if preferred. Bon appetit! This post is part of the monthly link up party Our Growing Edge. This event aims to connect food bloggers and inspire us to try new things. I love to eat moules marinieres, but this was our very first time making it at home and boy, is it easy! I never would have imagined that we could recreate a gourmet dish like steamed mussels; light some candles and whip up a batch of these for your next date night at home for a boost of fanciness and romance. This month is hosted by Leah at Sharing the Food We Love. 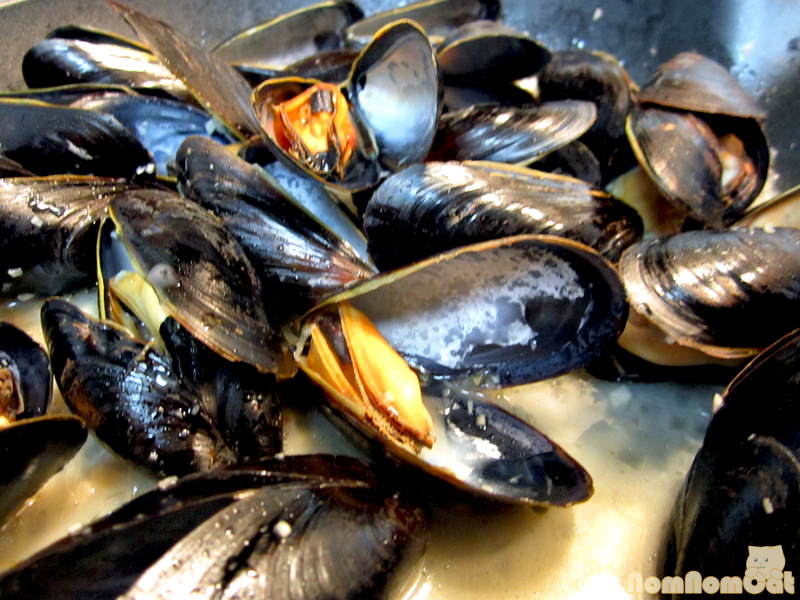 I love how simple and quick mussels are to prepare and they are one of the cheapest seafoods here in New Zealand. Are they cheap in LA also? Many restaurants here sell cooked mussels in 1 kilo pots. That’s over 2 lbs per person! Thank you for sharing this with Our Growing Edge this month. OMG i would love to devour a kilo of steamed mussels!!! Here they are very much affordable to bring home (we got our PEI mussels for about $4/lb) but expensive at restaurants (about $15-20 for a portion that’s probably 1.5 to 2 pounds). We’ll have to try them in NZ someday!! !